Handmade or Homemade - doesn't matter what you call it, but once you do make pasta from scratch, you'll never go back to dried. Pinkie swear. I know it sounds daunting, but it's really quite simple. Sure, it takes more time than just opening a box - but the ultimate difference in taste is absolutely worth it. 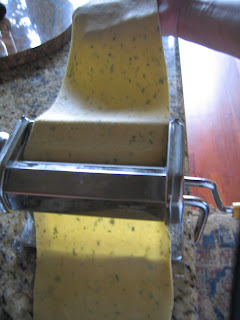 Once you have the base down pasta dough down, then you can make ravioli, linguine or pappardelle, anything really. I make fresh pasta for soups and lasagna even. Once you start making your own pasta a few times and really get the hang of it - then you can begin to experiment with wheat flours and flavored oils. A couple of quick notes- you will need to use some water, otherwise you'll end up with an egg noodle. I know first hand that they do not use water in Italy- but their eggs are different. Something to do with feeding the chickens carrots, which produces a protein rich yolk; the yolks are seriously orange in color! To oil, or not to oil. Growing up, I've witnessed knock down, drag out fights in my family about whether too add oil or not. I add oil and since this is my blog- the recipe I'm giving you has oil, extra virgin of course. Let's not anymore waste time- there's pasta to be hand! 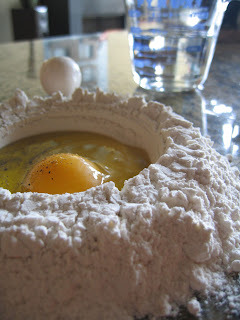 Make a well in the flour, add the eggs and oil. 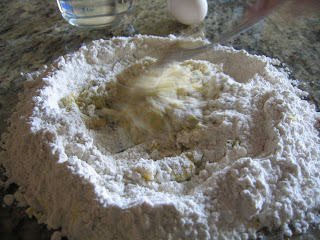 Mix with a fork, beginning to incorporate the flour around the edges. You'll need to add the water, but add just a few tablespoons at a time. Depending on the humidity, and how the flour is reacting that day, you may need to only add a little. If you get it to wet, it will be a mess and never form a ball. Too dry and it will crumble. But pasta is relatively forgiving. Give up the fork for your hands. The dough will feel and look like it's never going to come together- but keep working it, it will get there. This is a work out for your hands, forearms and core muscles! Once it gets to a final ball, continue to knead the dough for about 10 minutes. If you are not used to kneading, try to think about the goal of one silky pliable ball. Using the heal of your hands, push the dough together and forward. Now give it a quarter turn, pull the section farthest away from you back towards you, push the dough together using the heel of your hand again. You want to essentially pinch the dough together. Continue in this same manner. Eventually, you'll have a smooth, silky ball. Cover the ball with a piece of plastic wrap, and then a warm, moist cloth. Let sit for 20 minutes. Once your pasta has rested, you are ready to roll. 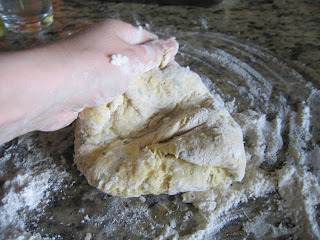 Cut the dough into four quarters, use one quarter at a time and keep the rest covered so it doesn't dry out. Lightly flour the dough, Begin by slowly rolling out the and the first setting. Fold that in half and roll it on the same largest setting again. Now move the setting to the next size and slowly roll again, adding more flour if necessary. 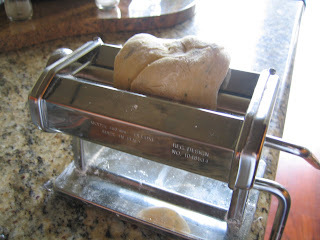 use one to roll and one hand to hold up and help the dough from piling and sticking together. Repeat this pattern until you have the thickness desired. At this point, add the secondary cutter to your pasta machine (it usually offer a linguine and a spaghetti cutting option.) Be sure to use lots of flour here to help keep the strips from sticking together. Another options is to take your long strip of pasta and lightly fold it in half, in half again and then one more time (if needed). Take a sharp knife and slice 2" lengths for Pappardelle. Or you can make ravioli, or simply cut what ever size you desire. Always use much more water you think you need, get the big pot out! Bring the water to a boil, add salt. Even if your not a salt fan, you must salt the water. Drop in your fresh pasta and you'll be amazed to see it floating in minutes. I'm talking like one or two minutes and your pasta is ready! If you're making ravioli, look to my classic five cheese Ravioli recipe or be adventurous and try my Fennel Sausage Ravioli recipe! Both are super tasty. Let me know how your pasta turns out ...after your done stuffing your face! 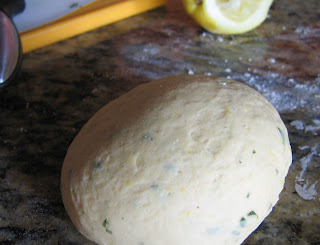 **the dough pictured is flavored with chevril and lemon, which explains why it looks spotted!